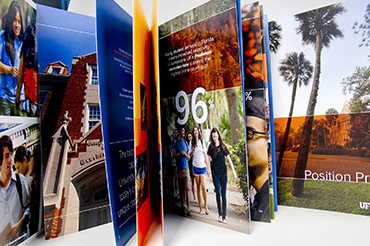 In late 2014 the challenge of helping to attract the next president to the University of Florida was a critical mission. 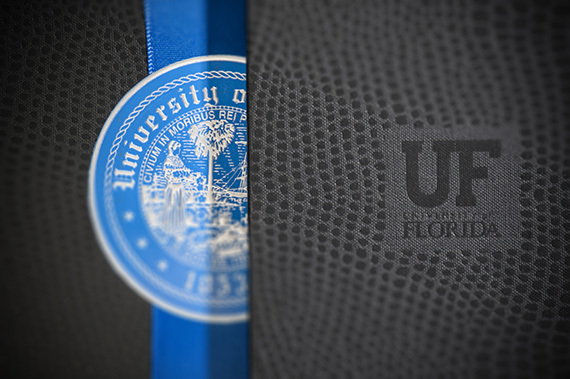 With renewed state legislative support, and funding accompanying a designation as a preeminent institution, UF was about to enter a new era of growth, and needed to find the right leader to fuel its rise into the upper ranks of public research universities nationwide. 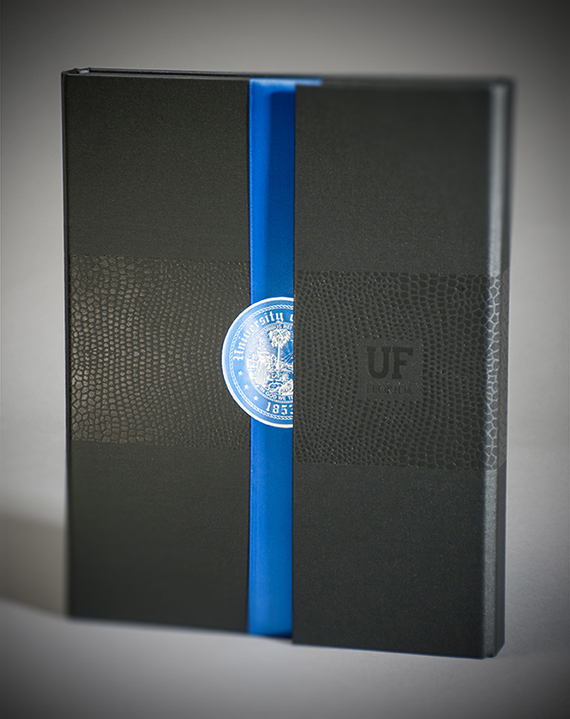 The search was a success, and President Kent Fuchs has already been heralded as a dynamic leader with a strong connection to UF faculty, students and staff, as well as a powerful vision to carry UF forward in the years to come. 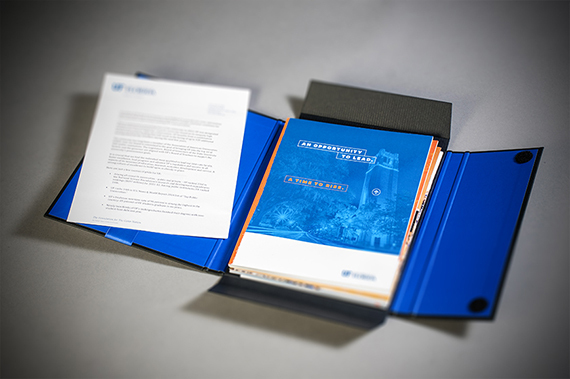 RIGHT: An ambitious package of materials was created for a very limited group of executive leaders, which included a bound + embossed black folio case with blue satin accents, collateral for a position profile and look book, as well as other materials. 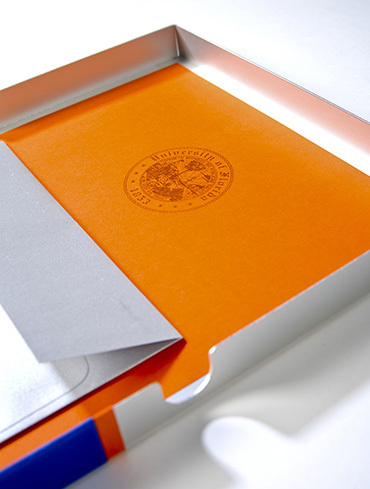 BELOW: In 2013 an intial search was begun, and a similar package was developed before ultimately the search was cancelled and put on hold for a year. 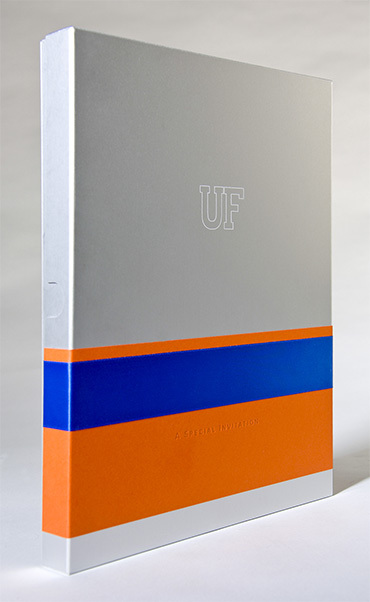 An anodized metal slipbox case was etched with the UF monogram, accented in orange paper and blue satin, and packed with collateral materials.